Spring is officially in the air. The trees are blooming, everyone has a sinus infection, and our little corner of lower Alabama is slowly turning into a muggy, rain forest-esque area that ensures I am constantly frizzy and a little sweaty. Spring, in my mind, is the pre-party for summer when my diet will primarily consist of fresh produce, frozen beverages, and anything made on the grill. These last few weeks before full-on summer mode make me want to reminisce on the deliciousness that ensued during the fall/winter months and celebrate it one last time. 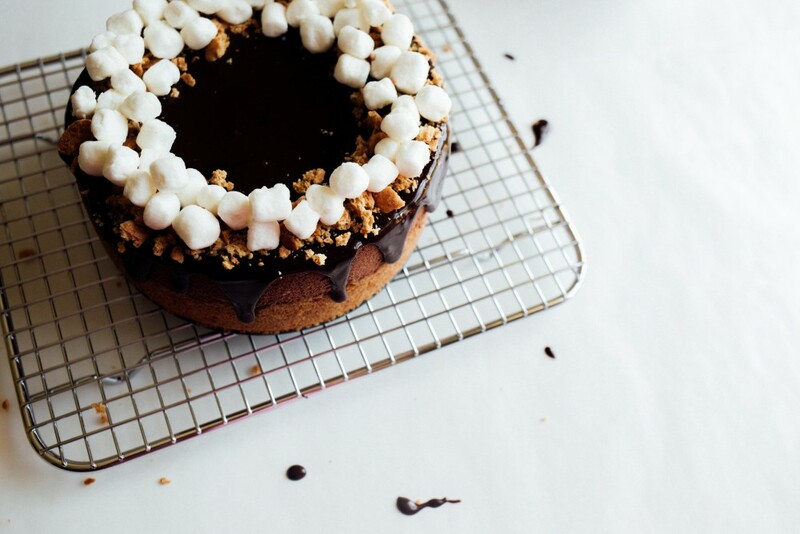 Today, we will do just that by way of s’mores cheesecake. Now don’t get me wrong- summer and I get along really well. What’s not to love? Longer days, flip flop weather, and the fact that I get to wear white everyday without any judgment from more fashionable onlookers is reason enough for me to celebrate the warmer months. 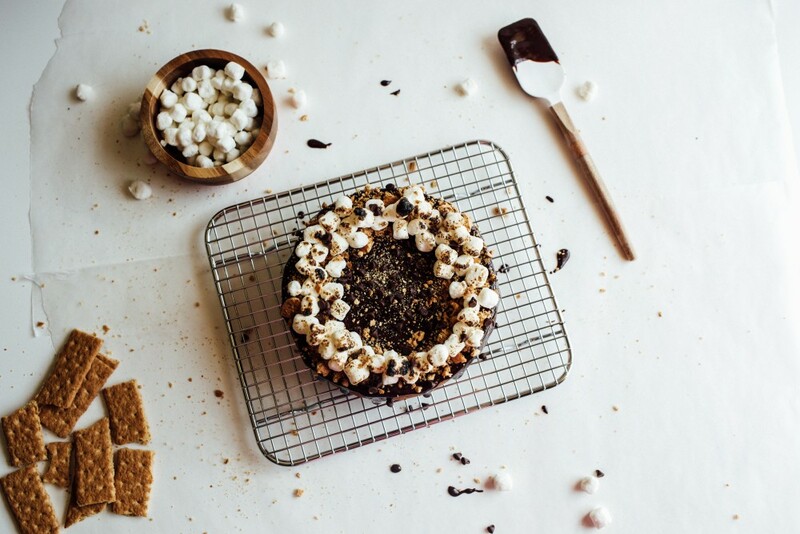 But once summer hits, I’m going to be rolling out all of my favorite fruit-based desserts and it’s really an injustice to forget little beauties like s’mores cheesecake. So let’s take a look, shall we? This cheesecake, with its creamy chocolate innards and buttery graham cracker crust, is topped with a handful or two of marshmallows and a rich, chocolate ganache that seductively whispers, “come hither.” I love the texture of this cheesecake- smooth, fluffy, and not too dense. Bonus points for the fact that I have never ONCE had this cheesecake develop an unsightly crack or crevice on the top. The crust is sweetened with brown sugar and seasoned with a heavy-handed douse of salt because, if you ask me, sweet and salty is still in. Chocolate cheesecake, graham cracker crust, and melty chocolate ganache practically begs for some festive little marshmallows, thus- s’mores cheesecake. Before we dive head-first into fish tacos, strawberry daiquiris, and giant slices of watermelon, let’s celebrate the right now with this s’mores cheesecake. I doubt you’ll be disappointed. 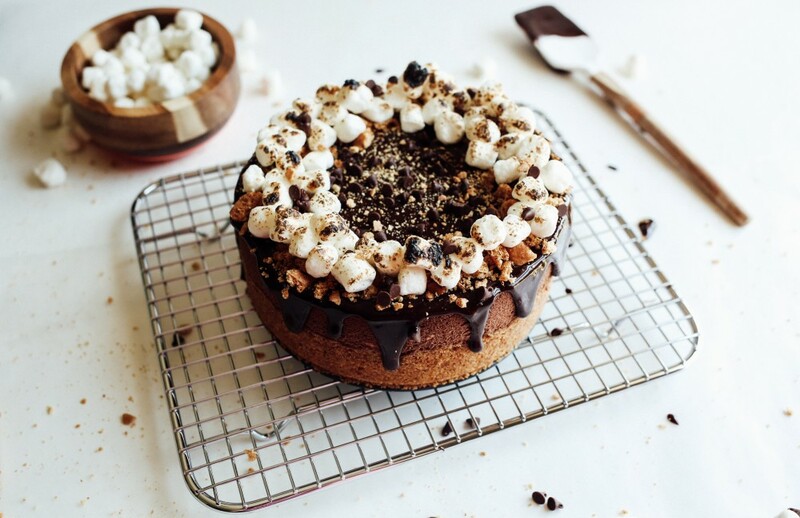 This s’mores cheesecake has a buttery graham cracker crust, a rich and creamy chocolate filling, and is slathered with a chocolate ganache before being topped with toasted marshmallows. Pulse graham crackers in a food processor to crumbs. Add the remaining ingredients and pulse until combined to a wet sand consistency. Pat crumbs into the bottom of a 9″ springform pan and bake in the oven for 10 minutes. Allow to cool. Preheat the oven to 350 degrees. Start a kettle or pot of boiling water on the stove top for the water bath. You’ll need about 3 quarts of water. Wrap your springform pan with crust baked inside securely with aluminum foil. I triple layer and make sure there is no room for the water bath to leak through the pan. In the bowl of a stand mixer, beat the cream cheese on medium speed until smooth, about 2 minutes. Add the sugar and cocoa powder, beating an additional 2 minutes. Add the eggs one at a time, beating on low speed until incorporated. Add the cream and vanilla, and beat until smooth and no lumps remain, about 2-3 minutes. Do not overbeat. Using a rubber spatual, push your cheesecake batter through a fine mesh strainer into a bowl. Pour this mixture into your prepared springform pan. Place your springform pan into a pan/dish slightly larger than the springform. I use a 10″ round cake pan, but any oven-safe dish with sides will do. Pour water into the water bath pan until the water level reaches almost halfway up the sides of the springform. Bake in the oven for 1 hour and 30 minutes. The filling will barely be set but will still jiggle slightly if jostled in the oven. Allow to rest in the oven with the heat turned off and the oven door propped open slightly (I use a wooden spoon) for an additional 30 minutes. Then, transfer the springform pan to the fridge and allow to cool for at least 4 hours or overnight, if possible. Once cheesecake is cool, remove from pan and prepare the ganache. Microwave the heavy cream on low heat just until it begins to lightly bubble. Remove from microwave and pour over top of the chocolate chips. Cover with Saran wrap and allow to rest for 5 minutes. Stir with a whisk until smooth and no lumps remain. 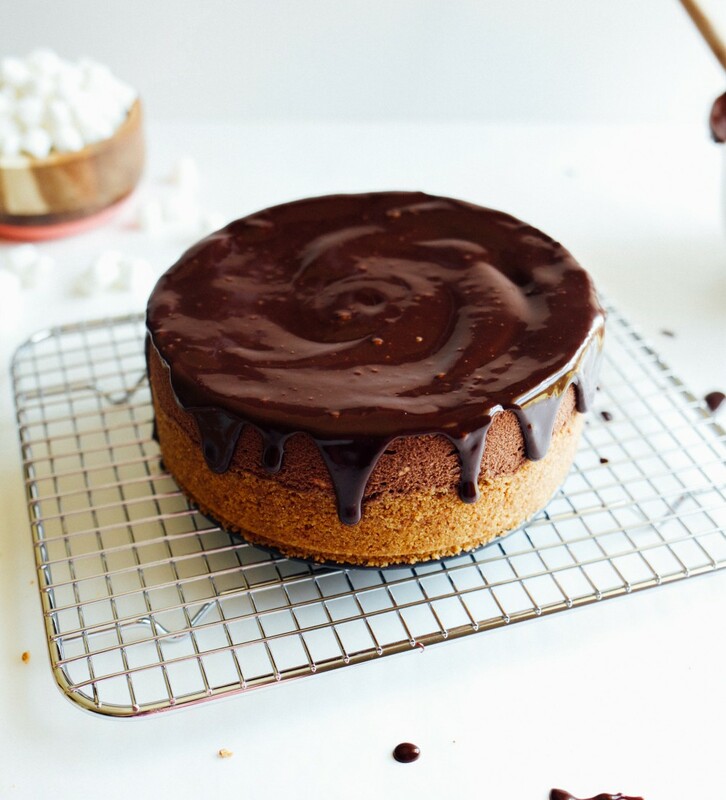 Allow to cool slightly- if your ganache is too thin, it will drip down the sides of the cheesecake too quickly. Spoon the ganache over top of the cheesecake and smooth out gently with a spatula. Once you get close to the edges, push the ganache out gently, allowing little trickles of chocolate to cascade down the sides. Allow ganache to set up slightly. Extra ganache will keep in the fridge for 1 week. Top with graham cracker crumbs and and a sprinkling of marshmallows. Toast with a torch or under a low-heat broiler until golden brown. Cheesecake will keep in the fridge for 4-5 days, but marshmallows should be toasted just before eating. Do not overmix your cheesecake batter. Overmixing can cause cracks and holes in your cheesecake. Be sure ingredients, particularly the cream cheese, are room temperature. If they are too cold, clumps will form and you won’t have a smooth and creamy cheesecake. Feel free to adapt this cheesecake! You can opt out of the marshmallows for a double chocolate cheesecake, or layer in peanut butter cups before baking for a peanut butter chocolate cheesecake. The world is your oyster!